Dirt roads, back roads & unmaintained roads in the scenic Berkshires. 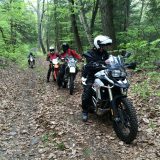 This ride will continue the tradition of a main route designed for adventure bikes with optional hero sections for dual sport bikes. Please note that this ride is designed for adventure bikes (i.e. GS 800, KTM 990, etc) and dual sport thumpers (i.e. DR 650, DRZ 400, WR250R, etc). This ride is not for 2 stroke enduro bikes. 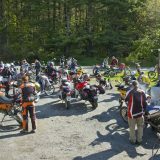 Two day main route is a big bike friendly tour of scenic dirt roads and country roads. There are optional hero sections made up of rough woods roads for properly equipped bikes. This event is AMA sanctioned. Membership is encouraged, but not required to participate.